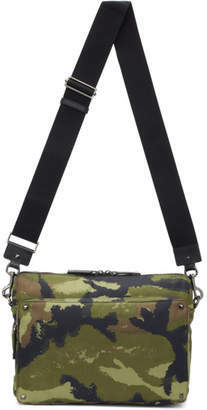 Nylon messenger bag featuring camouflage pattern in tones of green, black, and brown. Signature pyramid studs throughout. Detachable and adjustable shoulder strap with lanyard clasp fastening. Zippered compartment at face. Leather logo patch at back face. Two-way zip closure at main compartment. Patch pockets and zippered pocket at interior. Black textile lining. Gunmetal-tone hardware. Tonal stitching. Approx. 14 length x 11 height x 5.5 width. Part of the Valentino Garavani collection.